Ryan Reeves thought he had it made. The 19-year-old Christiansburg resident was living his dream of working at Volvo Trucks North America’s Dublin plant. “Shoot, that’s all I ever wanted to do,” he said. Reeves grew up visiting the plant often with his father, Rick, a 15-year veteran there. The younger Reeves became enamored of the factory, which provides the highest-paying production jobs in the region and exerts a strong influence over the New River Valley’s labor market. When Volvo announced plans last year for a $ 148 million expansion, Reeves was quick to apply for a job. He was among 725 new workers brought on last summer for a night production shift. Despite a booming national economy that has raised consumer confidence and lowered unemployment rates, the heavy truck industry is in a slump. Manufacturers across the country, accustomed to the volatile dips in the industry, are preparing for a downturn in part because there is an oversupply of used trucks and a shortage of truck drivers. Volvo was the first to cut its work force. Reeves was one of 900 workers laid off at the Dublin plant this month. The company is cutting production at the plant from 112 trucks a day to 80, a move company officials said was necessitated by a drop in demand. State labor officials are recommending $196,000 in fines against New River Castings Co. in Radford in the wake of a June accident that left a worker crushed and critically injured. The state Department of Labor and Industry completed its investigation of the accident last month and issued its proposed penalties Dec. 9 with two citations for five alleged safety violations at the plant. New River Castings and its sister plant next door, Radford Foundry, employ 1,065 people, making their parent company, Intermet Corp., one of the New River Valley’s largest employers. On June 14, foundry worker David Gravely was pinned inside a 900-pound press after lightning caused a power outage while he was cleaning sand out of air vents in the machine. Because the press lacked a device to keep it open without power, the top portion shut on top of him. The 29-year-old Dublin man suffered a concussion, broken ribs, punctured lungs and a crushed spine. He awoke nine days later with two 10-inch rods in his back and little feeling in his left leg. There’s a 92-year-old railroad tunnel here along Lusters Gate Road that serves as a marker when locals give directions. But the old tunnel means more than that. It’s a demarcation line between the northern section of the Ellett Valley – where high-priced housing developments are going up – and the remainder of the valley. That’s what Ellett Valley is becoming, a two-tiered community where the old and new, the unassuming and the ostentatious, coexist. A group of professionals working in Blacksburg, Christiansburg and beyond have been moving into the area once dominated by farming families. The valley also has become a community of contrasts. The antiquated railroad tunnel is too narrow for two vehicles to pass. Yet the valley is home to part of the $ 108 million “smart” road that’s being built to test the latest in high-tech transportation. Modest homes dot the valley while sprawling mansions, some with price tags topping $ 1 million, are being built on the overlooking hillside. Even the area’s name is a change. Until 15 years ago, the valley consisted of two communities: Ellett and Lusters Gate. Now it’s considered one, the Ellett Valley – with Hightop and Paris mountains on one side, and the steep climb up the divide to Blacksburg on the other. Whether the changes are for the better depends on your perspective. 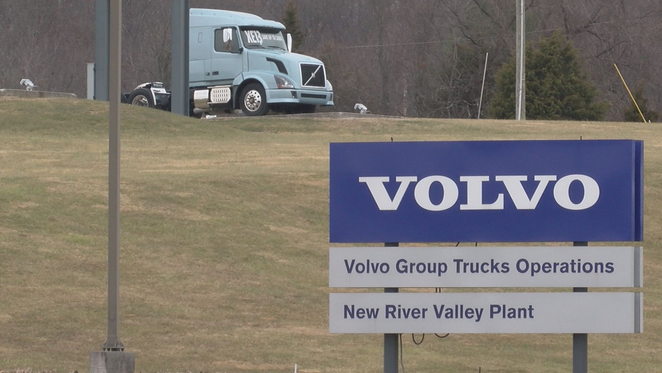 The Volvo Trucks North America plant in Dublin will lay off 21 hourly workers this week and another 28 possibly next week, a union official said Thursday. Bill Burton, president of United Auto Workers Local 2069, said the layoffs are based on seniority. The first group of workers was hired in August; the second group, whose number hasn’t been finalized, includes workers hired after July 12. 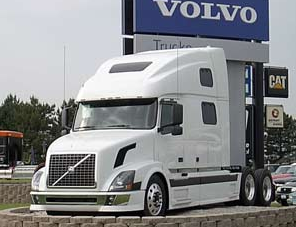 Volvo spokesman Phil Romba said Thursday he will continue a company policy of not commenting to The Roanoke Times. The Dublin plant, which has 3,225 workers, is the New River Valley’s second-largest employer. Volvo began a $148 million expansion project in July that company officials said would create 1,277 new jobs. So far this year Volvo has hired at least 725 new assemblers and started a second shift that produces 42 tractors a day. A union official at Celanese Acetate, the New River Valley’s eighth-largest employer, said the company became a public corporation this week to ready itself for potential buyers. But Celanese officials say that is untrue. Azel Buckland, president of the Union of Needle Trades, Industrial and Textile Employees Local 2024, said although the company is doing well, its German parent, Hoechst AG, wants to unload it. The manager of the Volvo Trucks North America plant in Dublin said Tuesday that the company seriously considered moving the plant to Mexico during a labor union dispute this year. Plant manager Tom Murphy told the Blacksburg Regional Chamber of Commerce that Volvo wouldn’t have been able to start its $ 148 million expansion project without concessions by the United Auto Workers and a $ 60 million incentive package by the state. Murphy declined to explain his statements after the chamber speech, in which he gave a slide presentation about the plant. However, during the speech he said he visited two manufacturing plants in Mexico to investigate the feasibility of moving the Dublin plant, the New River Valley’s second-largest employer. Foundry worker David Gravely knew he was going to die when he saw the upper portion of a 900-pound press closing in on him. The 29-year-old New River Castings Co. worker had just one thought – he’d never see his wife and children again. The last thing he remembered before losing consciousness was the sound of his hard hat cracking under the press’ pressure. Gravely blacked out as the press came down on his head, broke two of his ribs, punctured both lungs and crushed his spine. He awoke nine days later with a concussion and little feeling in his left leg, but a very lucky man. Gravely’s June 13 accident was as freakish and terrifying as they come. The state Department of Labor and Industry is investigating an accident in which a Pulaski man was crushed in a 900-pound press at New River Castings Co. last week. David Gravely, a 28-year-old press operator, is now listed in good condition at the University of Virginia Medical Center in Charlottesville after a press closed on him during a power outage, according to Edward Ramsey, president of United Steelworkers of America Local 9336. The accident happened June 13 when the top half of the press Gravely was cleaning lost power because of a lightning storm. The machine lacked a device to keep it open without its main power source and crushed the worker, Ramsey said. “They didn’t have a blockout or lockout on it to hold it in place,” he said. The company has since placed such safety devices on its presses. But it’s too little, too late for Gravely, Ramsey said. Magnox Pulaski Inc. is laying off 18 workers because of a slump in the Asian and Russian economies, company officials said Thursday. Thirteen hourly workers and five salaried workers were notified Thursday morning, according to Magnox attorney Deborah Dobbins. The company hasn’t determined if the layoffs will be permanent or temporary. The Pulaski company, which now has 99 workers, makes magnetic oxides for use in the production of video, audio and computer tapes. It exports about 60 percent of its product. After threats by Volvo Trucks North America to scuttle a $148 million expansion project, members of the United Auto Workers ratified a new contract Thursday, three days before the company’s deadline. UAW Local 2069 President John Sayers said the threat was a factor in the vote. “It put pressure on us, and it was designed to put pressure on us,” he said. Union members voted 1,253-562 for the six-year contract, which will start new employees at 30 percent less than base pay and require an eight-month waiting period for health insurance. Eleven days earlier, the union rejected a similar contract, but Volvo made a counteroffer that shortened the waiting period for new workers’ health benefits by two months while the union gave up an allowance for safety shoes worth about $300,000 over the life of the contract. Sayers said the union recommended that workers ratify the new contract. The UAW’s former contract was due to expire in March 2000. Volvo had threatened to reject a $54.2 million state incentive package to build the expansion and move part or all of the plant if workers didn’t accept a contract by Sunday. “I don’t know what we’d have done without this,” said Charles Cook, a member of the Pulaski County Board of Supervisors who also is president of Pulaski Encouraging Progress, a local economic development organization. “It’s going to put us on the map for the state. It’ll put us on the map for the state and the nation, if Volvo goes through with the merchandising plan that they have,” he said.